The incorruptibility of the old bureaucracy has a rather simple and rational explanation: Most of the time, it did not pay to be a corrupt official under Kim Il-sung. Money was of surprisingly little use in the 1960s and 1970s, when pretty much everything was rationed and distributed by the state according to predetermined quotas and norms. In those days officials lived significantly better than the average North Korean, no doubt. But they were affluent not because they had significantly more money (the wage differential between a top official and a humble worker was remarkably low), but rather because they had access to higher-quality goods and services that were not available to the common people. One of my North Korean interlocutors said: “Back in the 1980s, I did not care about money. Nobody did, since money did not buy much in those days.” In those days, in the 1970s or 1980s, one had to be an official to drink beer every week, to smoke cigarettes with filters, or feast on pork a few times a month. But officials did not buy these goods at market; rather they received them from the state as part of their special (very special) rations. In this situation, it did not make sense for an official to accept bribes as a reward for overlooking some misbehavior or violations of some rules. 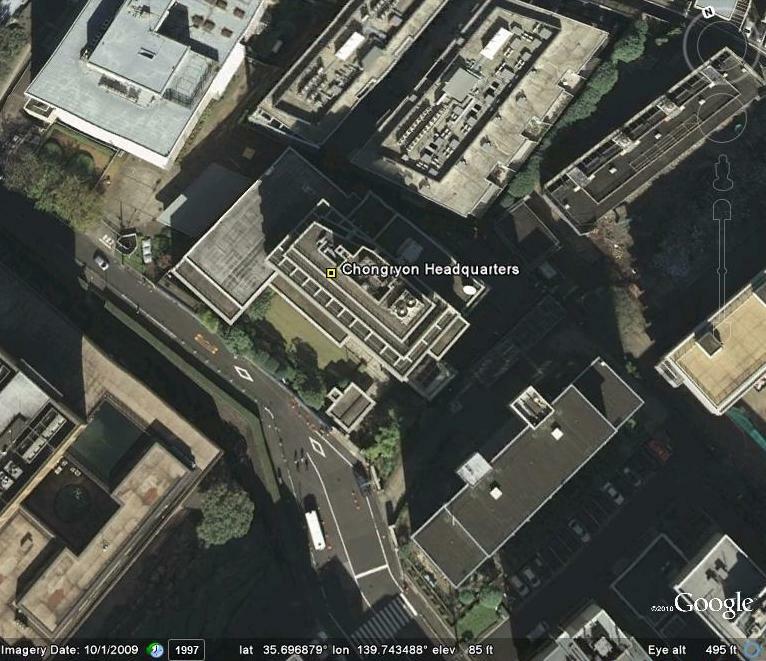 Money would not be particularly useful and at the same time there was a significant risk of being caught. If caught, an unlucky official would at best lose his or her job and at worst even freedom, and no amount of money would compensate for this disaster. We are conditioned to see official corruption as an evil, but in present-day North Korea, corruption might be a life-saver. 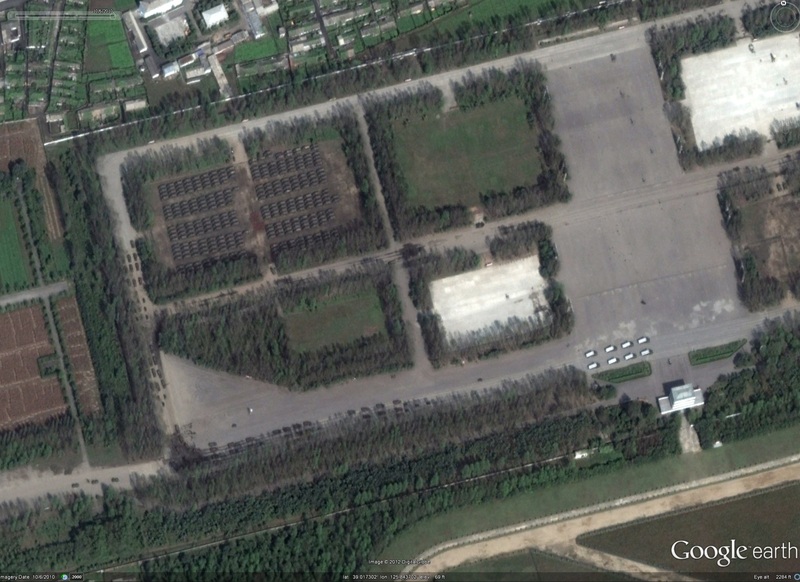 The average North Korean gets most of his or her income (about 75%, if recent estimates are to be believed) from private economic activities – these include private agriculture, trade and small-scale household production, and myriad other things. Nonetheless, nearly all of these activities remain technically illegal. Unlike China, North Korea has never undertaken serious economic reform, so private economic activities are still considered crimes, even though they have long become, in practice, a universal norm (and without such activities many would be unable to stay alive). The only reason these activities are able to exist is corruption. 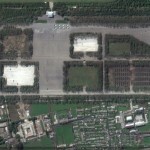 Without widespread corruption, many more North Koreans would probably have perished in the great famine because there would have been no way to have private agriculture, and it would have been nearly impossible for private traders to move food across the country, delivering it to areas where the food situation was especially dire. After all, trade in grain and long-distance travel for commercial purposes are both technically crimes. No markets would be possible had the local bureaucracy been serious about enforcing a multitude of bans and restrictions on commercial activities. Even when the Kim family regime meets its eventual demise, when a new North Korea emerges, the culture of corruption may remain as part of its heritage. And perhaps eventually it will become a serious burden to a resurgent North Korean economy. Regarding this last point, see this post. When one talks about virtually any country, wages and salaries are one of the most important things to be considered. How much does a clerk or a doctor, a builder or a shopkeeper earn there? What is their survival income, and above what level can a person be considered rich? Such questions are pertinent to impoverished North Korea, but this is the Hermit Kingdom, so answering such seemingly simple questions creates a whole host of problems. We could look first at official salaries but this is not easy since statistics on this are never published in North Korea. Nonetheless, it is known from reports of foreign visitors and sojourners that in the 1970s and 1980s, most North Koreans earned between 50 to 100 won per month, with 70 won being the average salary. You can watch the video of the entire speech on YouTube here. 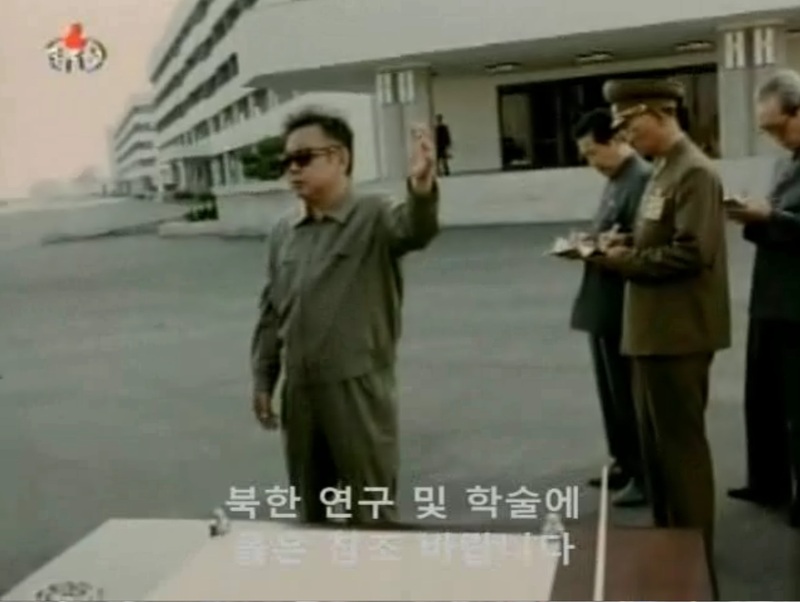 And just for fun, here is a link to Kim Jong-il’s only public address which I posted to Youtube last year. 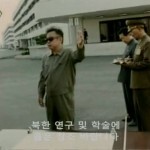 I also posted this video of Kim Jong-il speaking at a meeting with South Korean president Roh Roh Moo-hyun. 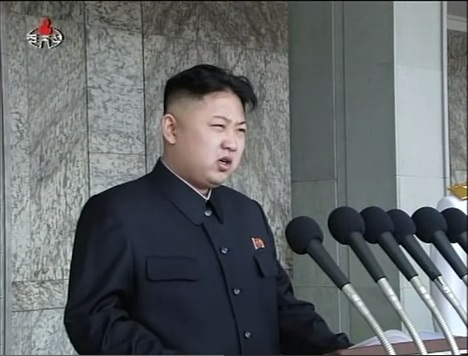 Kim Jong Un, the first chairman of the National Defence Commission of the DPRK, made his first speech during a military parade to commemorate the centenary of the birth of his grandfather, Kim Il Sung. The Rodong Sinmun, the official newspaper of the Central Committee of the Workers’ Party of Korea, released an article on April 19 with the details of the speech. In the article, Kim Jong Un emphasized, “songun is our autonomy, dignity and life” and pledged to uphold the songun politics to continue the teachings of his father, Kim Jong Il. Kim Jong Un also underlined that the most important national agenda is becoming a powerful nation through improving the national economy, and resolving the food shortage problem. In addition, he stressed that strong knowledge-based economy must be built by way of new industrial revolution. First, in order to resolve the food issue, agricultural production should be improved through investment and technological assistance from the state level. Grain yields should be increased to reach the grain production goals to normalize food distribution for the people. Second, light industry must be reinforced to resolve the shortages of daily necessities. Specific measures should be established to secure raw materials and to improve the quality to elevate the demand of North Korean products. Third, housing, food, fuel and other issues related to livelihood must be given priority to improve the quality of life for the people. Fourth, basic industrial sectors must be developed to build a strong foundation for economic development which can lead to advance production in all areas of the people’s economy. Fifth, power, coal, metal, and railway system should lead the way to revitalize the people’s economy and stabilize the lives of the people. In particular, power production must be drastically increased and distributed in order to effectively improve the quality of life and monitoring and control must be reinforced. Sixth, the nation must be established as a strong knowledge-based nation. It was acknowledged that the world is quickly transitioning to the informatization of the economy and North Korea must develop the national economy and build an economic structure that meets international demand. Science and technology should be the forerunner to incorporate science and technology with production and resolve all problems in the economic development process from the science and technology aspect. UPDATE 1 (2012-4-18): Martyn Williams somehow managed to put up a full English translation of the talk. Pyongyang, April 15 (KCNA) — The dear respected Kim Jong Un made a congratulatory speech at the military parade celebrating the centenary of the birth of Generalissimo Kim Il Sung. 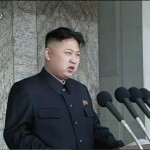 In his speech Kim Jong Un said that the military parade is a great festival of victors which was provided according to the noble intention of leader Kim Jong Il and on his direct initiative to glorify forever the feats Kim Il Sung performed in the army building and demonstrate the might of the socialist power before the world. Kim Il Sung, who directed primary efforts to strengthening the revolutionary armed forces in the whole period of his protracted revolutionary activities, worked such military miracle in the 20th century as defeating the most ferocious two imperialisms in one generation, trained the Korean People’s Army into a match-for-a hundred revolutionary army, put all the people under arms and turned the whole country into a fortress, providing a strong military guarantee for the sovereignty of the country and the eternal prosperity of the nation, he noted. The Korean revolutionary armed forces have fully demonstrated the might of the powerful revolutionary army distinct in its revolutionary nature and strong in its militant spirit and might under the care of Kim Il Sung and Kim Jong Il. The military and technical superiority is no longer a monopoly of the imperialists and gone are the days when the enemies could threaten and blackmail against the DPRK with A bombs. The far-reaching strategy and final victory of the Korean revolution lie in advancing straight along the road of independence, the road of Songun and the path of socialism indicated by Kim Il Sung and Kim Jong Il. It is the firm resolution of the Workers’ Party of Korea to enable our people, the best people in the world who have remained loyal to the party, overcoming all difficulties, to live, without tightening their belts any longer, and fully enjoy wealth and prosperity under socialism. The WPK and the DPRK government will join hands with anyone who truly wants the reunification of the country and the peace and prosperity of the nation and make responsible and patient efforts to accomplish the historic cause of national reunification. The sun’s flag of Kim Il Sung and Kim Jong Il will fly forever before the ranks of the Korean revolution demonstrating victory and glory only and will always encourage us to win fresh victories, he concluded. UPDATE 1: By coincidence NK Leadership Watch and I posted on a similar topic today. See his post and analysis here. The official explained the reason for the ongoing parade practice as part of preparations to commemorate Kim Il Sung’s birthday (April 15) and the Mlitary Foundation Day (April 25). The military parade practice has so far involved the Worker and Peasant Red Guard, which is made up of currently-serving soldiers and reservists, mobilized with the latest-model tanks, armored cars, as well as short and medium range KN-02 and Musudan missiles. The logistics of these parades are enormous. I learned a lot about them back in November at a meeting with Osamu Eya in Japan. Among the many things we discussed, I asked him where the North Korean military practices their parades through Kim Il-sung Square. He answered with a single word: “Mirim”. 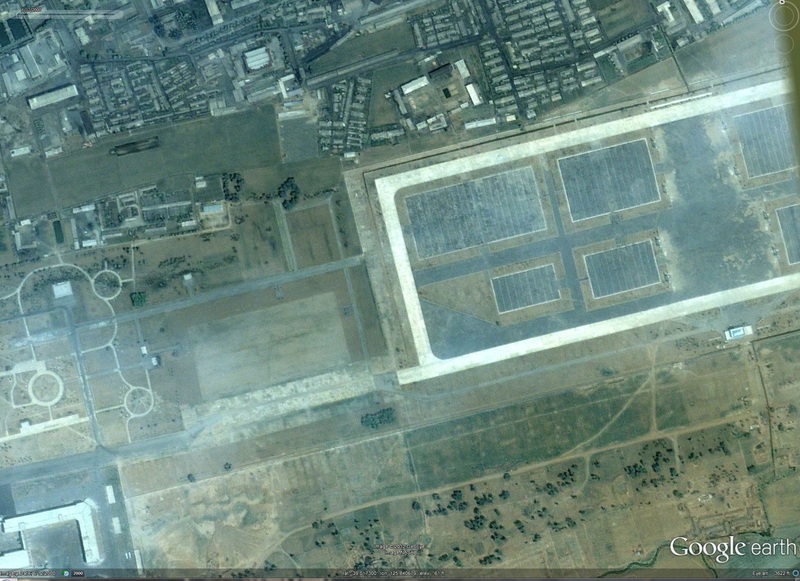 Now I am kind of embarrassed to admit that I never saw the resemblance (because I thought of the Mirim area as a runway strip and because the two places are not geographically laid out in the same directions). 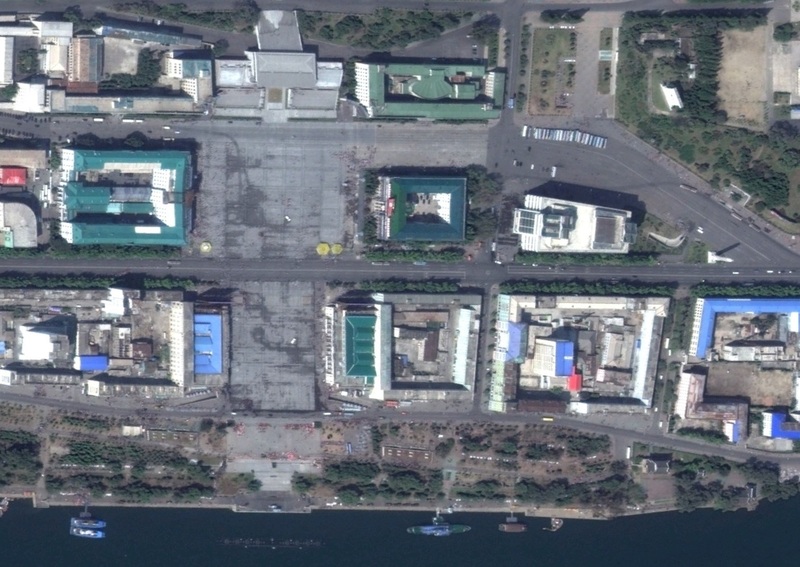 Once you rotate the satellite images and set them next to each other, however, there is no denying that the KPA has a Kim Il-sung Square-sized practice area from which to rehearse its grand military parades. 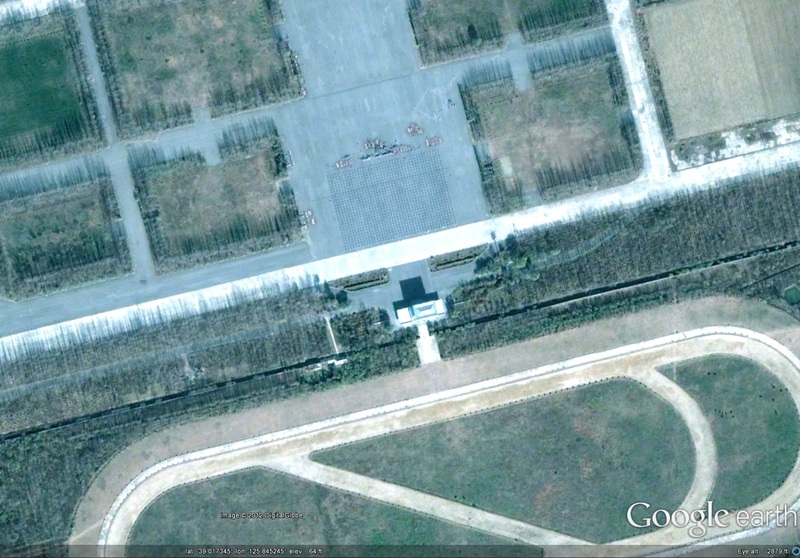 Pictured above (Google Earth): (L) Kim Il-Sung Square, (R) Mirim parade practice area. The April 25 Hotel has been built on the outskirts of Pyongyang as a monumental edifice in the era of the Workers’ Party. The hotel with a total floor space of more than 134,000 square metres and accommodation for 20,000 guests has bedrooms, cultural and welfare facilities and cook equipment on a highest level. It will serve servicemen and civilians who participate in national military and civic events. 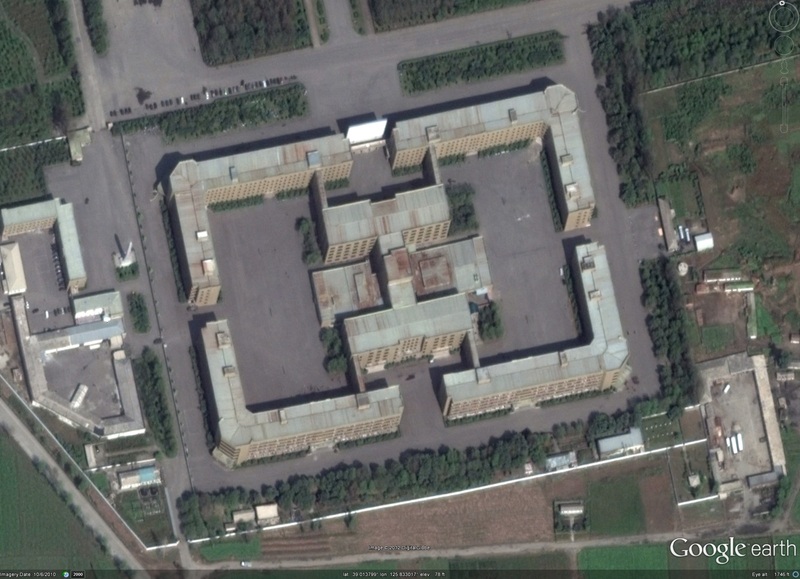 Soldier-builders successfully finished this gigantic project–erection of buildings, assembling of equipment and arrangement of the area–in a little more than one year. A ceremony for the completion of the hotel took place on Tuesday. Present at the ceremony were Jo Myong Rok, Kim Il Chol, Kye Ung Thae and others. A congratulatory message of the Workers’ Party of Korea Central Committee was conveyed to the soldier-builders and helpers who had performed feats in the hotel construction. The message noted that the April 25 Hotel, a monumental edifice of the era, has been built in a short span of time under the present conditions that all the people have to overcome manifold trials and hardships in their advance. it could be done only by the revolutionary army of Korea who knows no impossibility, and it is a proud fruition produced by the might of the army and people rallied around the party as one in mind, it stressed. Highly praising the soldier-builders and helpers for demonstrating again the potentials and stamina of socialist Korea by completing the hotel, the message expressed the belief that they would make greater success in carrying out their revolutionary duties. Jo Myong Rok made a report at the ceremony. The reporter said that the heroic and proud feats performed by servicemen in the noble work to carry out the WPK’s grand plan for construction will be always remembered by the fatherland and handed down to posterity. 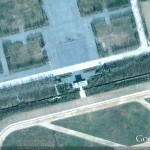 [Kim Jong-il] then went to the April 25 Hotel which was newly built on Mirim plain. Looking round the interior and exterior of the hotel including a bedroom, a washroom, a dining hall and a kitchen, he learned how the hotel had been built. He highly praised soldiers and helpers for having built the hotel in a short span of time and contributed to demonstrating the potential and stamina of socialist Korea once again. He said the construction of the hotel in a short span of time is a miracle that can be worked only by the heroic Korean People’s Army (KPA) which is intensely loyal to the party. He added that the country will always remember the soldiers’ heroic feats and proud achievements in socialist construction. He called for equipping the hotel, an asset of eternal value for the army and people, with better facilities, planting many trees around the hotel, creating a pleasure park and providing those who stay in the hotel with good conditions for cultured life. As many servicemen and civilians will use the hotel, they should be given best services, he said, and gave the hotel important tasks for its management and operation. The Chairman of the DPRK National Defence Commission was accompanied by director of the General Political Department of the KPA Jo Myong Rok, chief of the general staff of the KPA Kim Yong Chun, Minister of the People’s Armed Forces Kim Il Chol and general officers of the KPA. This year proud successes have been reported from the DPRK in face of difficulties brought on by the combined effects of the never-ceasing campaign of the imperialists to stifle the DPRK and years of natural disasters. The most remarkable success gained in the forced march this year is artitifical satellite “Kwangmyongsong 1” which was launched into orbit on august 31. The scientists and technicians of Korea launched into orbit the first artificial satellite, a product of their own wisdom and technology, fully demonstrating the national power of Korea with a powerful scientific and technical force and the solid foundations of the independent national economy. 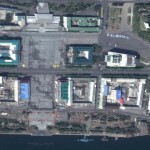 Bulky April 25 Hotel and September 9 Street sprang up in Pyongyang to commemorate 50 years of the DPRK (September 9). 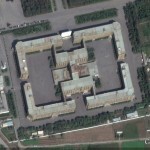 The hotel with modern equipment and accommodation for 20,000 is on the east outskirts of the capital city. The street linking Pyongyang Airport to the Kumsusan Memorial Palace, the sacred temple of Juche, gave a major face-lifting to the northwest area of the capital city with bridges of special characteristics, flats for thousands of households, ornamental forests, scores of metres wide, on either side of the highway in good harmony with landscape. Thousands of minor power stations were built across the country this year. The locally-built minor power stations in Jagang Province meet the needs for the lighting of the flats for more than 100,000 households and the production of local-industry factories. Flats for 10,000 households in Chongjin, an industrial city, benefit from electric heating. A growing number of cities, counties and units are offsetting the demands for electricity with electric energy turned out at minor power stations. The Huichon General Machine Tool Plant produced hundreds of machine tools in a matter of a few months. In the railway transport diesel engine locomotives were converted into electric locomotives called “forced march.” 60 kilometre-odd-long railroad between Haeju and Ongjin, between singangryong and Pupho in the central area of the country was switched over to a broad-gauge one. 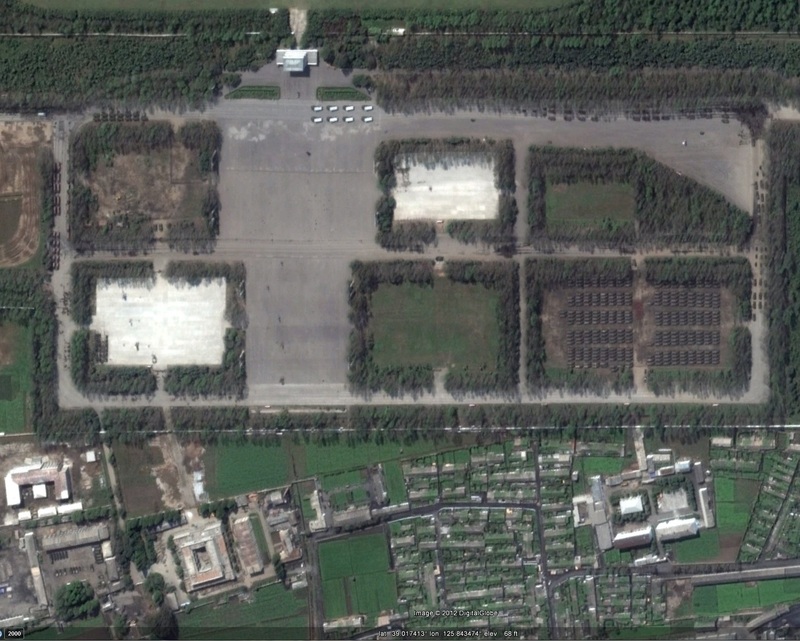 The Pyongyang Integrated Circuits Factory, salt refineries and other industrial establishments were commissioned or completed throughout the country. As a result, a more solid economic foundation of the nation was laid. NOTE: I have not seen this report yet, so I cannot directly comment. If you see a copy, please send it to me. If 1995 represented a baseline level of 100 for the North Korean economy, then by 2009 it had declined to 86.5 following sharp reductions in inter-Korean aid over the preceding year, according to newly released economic analysis. The analysis, ‘Research into the State of Inter-Korean Change Seen through Statistics,’ was produced by the Sejong Institute pursuant to a request from Statistics Korea, the South Korean state statistics body. The report incorporated ten different statistical variables, including North Korea’s estimated food and electricity production, trade and finance volumes and levels of international aid. During the March of Tribulation, the mid-1990s famine that killed hundreds of thousands of North Koreans, the economy declined to a nadir of 70.3 (in 1998), according to the report’s findings; conversely, at the very peak of ‘Sunshine Policy’ aid deliveries in 2007, it reached a level of 104.7. Elsewhere, North Korea’s food production had risen to 119 by 2009, while coal and electricity production had reached 107.6 and 102.2 respectively, it also reports. Conversely, steel production declined to 81.8, marine production to 63, and oil imports to 47.1. The report notes pessimistically that current difficulties are set to continue, adding that even if North Korea embarked on root and branch reform tomorrow, in many cases it would already be too late for recovery without massive and sustained investment. “In a society like North Korea where politics dominates everything else and the biggest impediments to state development, dictatorship and the 3rd generation succession, normal economic development is impossible,” it concludes. North Korea`s economic prowess has deteriorated due to stalled inter-Korean relations since peaking in 2007 due to expanded aid from South Korea and trade with China, a report released Monday in Seoul said. The North`s economic ability peaked to 104.7 in 2007, up from the benchmark score of 100 in 1995, but plunged afterward to as low as 86.5 in 2009, the Sejong Institute said in the report prepared at the request of Statistics Korea. The Stalinist country`s economic prowess was based on 10 indicators including steel and electricity production, trade volume, state budget and the value of the South’s assistance to the North. The North Korean economy began to deteriorate from the mid-1990s, when millions of people starved to death due to famine, and the economic ability figure fell to as low as 70.3 in 1998. It rose again, however, and reached 104.7 in 2007. South Korean assistance to the North surged to raise the indicator to a high of 236.9 in 2007, a huge leap from the baseline score of 100 in 1995. The communist country`s trade volume also jumped 43.4 percent due to the expansion of trade with China. The North`s economy began to shrink from 2008, when the South halted aid. Notably, the indicator fell to as low as 86.5 in 2009 to tie the record-low set in 2000. Due to deterioration of inter-Korean relations, the volume of South Korean government assistance to the North tumbled over the period to 36.2 in 2009, down 84.7 percent from that in 2007. A decline in external trade except with China due to tougher international sanctions against Pyongyang also hastened the deterioration of the North Korean economy. Due to the participation by Singapore, one of the North`s top five trading partners, in the sanctions, the combined volume of the North`s trade fell about 10.7 percent, resulting in the indicator falling from 186.3 in 2008 to 166.3 in 2009. 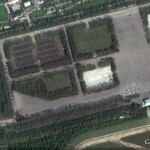 Here is a link to the Statistics Korea page on North Korea. 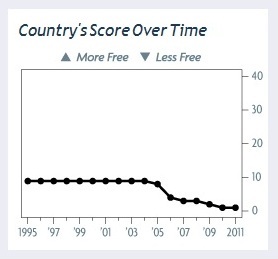 Pictured above: An annual index measure of economic freedom in the DPRK from 1995 to 2011, published by the Heritage Foundation’s and Wall Street Journal’s Index of Economic Freedom. [The] Heritage foundation and the Wall Street Journal recently published a new edition of their annual index of economic freedom, according to which North Korea has the world’s least-free economy. One can hardly argue about this – North Korea has for decades worked hard to take Stalinism to its logical extremes, and slightly beyond that. However, one gets perplexed when looking at the grades of unfreedom that are given by the Heritage Foundation to the North through the 1995-2011 period. According to the index, the level of economic unfreedom in North Korea was essentially the same throughout the entire 1996-2005 period. Then, in 2005 it deteriorated considerably and has continued a slow downward slide until now. This depiction is bound to raise the eyebrows of anyone who is familiar with actual economic trends in North Korea. The graph is correct when it says that the economy became more restrictive in 2005, when the government tried to re-introduce the rationing and reconfirmed the ban on the private sale of grain (such a ban had existed since 1957, but ceased to be enforced around 1990). However, the 2005 measures were, essentially, a backlash, an attempt to reverse the half-baked reforms of 2002 – and those reforms can be described only as liberalizing. On balance, the 2002 reforms should not be overestimated. Nonetheless, the 2002 reforms legalized a significant part of the black economy, and also granted managers of state-owned industrial enterprises a measure of managerial freedom they had not had for many decades. If this was not an increase in economic freedom, what was it? But the Heritage Foundation graph does not give any hint of this change: the line that purports to depict the level of economic freedom remains on the same low level in 2002. This is more interesting because 1997-2002 was when actual economic freedom increased dramatically. The old hyper-Stalinist laws remained technically effective, but nobody bothered to enforce these restrictions. It is estimated that in the early 2000s, the average North Korean family drew some 80% of its income from various market activities. This was technically illegal, but the authorities were ready to turn a blind eye to the re-emergence of some form of a market economy, and in 2002 they even grudgingly and partially legalized the already flourishing market economy. However, these improvements – both de-facto and, in 2002-2005 de-jure – find no expression in the flat line of the Heritage graph which, however, does not fail to notice that after 2005 the situation again began to deteriorate due to a government backlash against the private economy. The backlash was not particularly successful, but it lasted until 2009, and this is correctly reflected by the downward line at the graph. However, then the graph begins seriously misleading again – and again, seemingly due the same implicit assumption that in North Korea things can go only from bad to worse. The graph depicts 2009 as a year when the level of freedom went even lower – and this is a correct assumption, since in 2009 the authorities undertook currency reform. The reform’s main, if not sole, purpose was to annihilate the private economy that had survived the 2005-2009 backlashes surprisingly well. There is little doubt that North Korean decision-makers really want, above all, to revive the hyper-Stalinist economy that alone guarantees the regime’s long-term political stability (or so they – and the present author – believe). However, the 2009 bold attempt to go back to the Stalinist ways ended in complete and pathetic failure – and the government, fearful of the chaos its inept reform created, backpedaled immediately. The failure of the 2009 currency reform was followed by another wave of economic liberalization. In May 2010, the government lifted all restrictions and bans on private retail trade that were introduced in the 2005-09 backlash. In fact, the North Korean economy nowadays is roughly as free (or rather unfree) as it used to be immediately after the 2002 reforms. But there is no hint of this roller coaster changes in the slowly descending line of the Heritage Foundation Index. The same is applicable to the economic situation. Every year, we get reports about a looming famine in North Korea – and this year is no exception. A quick look through headlines of major newspapers can clarify that such reports surface with predictable regularity every year. In March 2008, the International Herald Tribune ran a headline “Food shortage looms in North Korea”. In March 2009, the Washington Post headline said “At the Heart of North Korea’s Troubles, an Intractable Hunger Crisis”. One year later, in March 2010, the Times of London warned: “Catastrophe in North Korea; China must pressure Pyongyang to allow food aid to millions threatened by famine.” In March 2011, The New York Times wrote: “North Korea: 6 Million Are Hungry.” The predictions of gloom come every year, but famine does not. Actually, from around 2002-2003, we have seen a steady but clear improvement in North Korea’s economic situation. North Koreans are still malnourished, and likely to remain so for the foreseeable future. Nonetheless, they are not starving any more – at least not in significant numbers. However, opponents of the regime cannot admit that people are not starving or report about (however marginal) improvement of the food situation, since, as I have said, from their viewpoint nothing can possibly improve in North Korea. 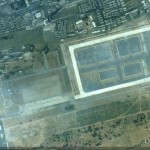 At the same time, supporters of the regime will not admit that the North Korean people are still malnourished, and the regime itself is active in presenting exaggerated evidence of a looming famine (or perhaps, even fabricating such evidence when necessary) – as this will help it get more free food from the outside, and this is what Pyongyang needs. One can see the same trends everywhere. For example, human-rights non-governmental organizations keep telling us about a further deterioration in the human-rights situation in the North. 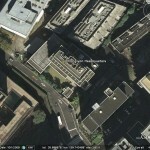 However, the evidence tells a different story. Human rights are still by far the world’s worst, but they are better than 20 or 30 years ago. Just one example of this under-reported improvement will probably suffice. Until the mid-1990s, the entire family of a political criminal – that is, all people who were registered at the same address as he or she, were by default shipped to a concentration camp. Some 10 or 15 years ago, this approach ceased to be universal, so families of many political criminals – including some prominent activists based in Seoul – remained free. There is little doubt that families are harassed, and even distant relatives of dissenters are denied good jobs and/or the right to reside in Pyongyang and major cities. Nonetheless, there is a great difference between inability to live in a major city and incarceration in what might indeed be the world’s worst prison camp system. However, this change is seldom reported. Human-rights advocacy groups obviously cannot bring themselves admit that something can get better under the Kim family regime. Probably, they think that such admission would make the situation look less urgent and thus would help the Kim family regime in some indirect way. These worries might be even well-founded – but the result is the tendency to ignore a particular type of “politically incorrect” news. Paradoxically, regime sympathizers – whose presence is especially noticeable among the South Korean left – are equally reluctant to attract any attention to these minor improvements. It is understandable, since we are talking about changes from the awful to the very bad, and Pyongyang champions cannot bring themselves to admit how brutal and inefficient the regime actually is. For example, if pro-Pyongyang media outlets report that the “family responsibility” principle does not apply in many cases, they would have to admit that in the supposed “paradise” of national purity and/or anti-globalist determination in North Korea, not only dissenters, but their families as well were shipped to concentration camps until quite recently. No member of South Korea’s radical nationalist left could bring him or herself to admit this fact. The sad irony is that this change is actually an improvement, but neither side of the political debate is going to report it. This is confirmation to the old truism: political passions make people oblivious to the obvious. However, propaganda is a poor substitute for honest and objective analysis – even when such propaganda is produced by people who believe it themselves. You are currently browsing the archives for the Arduous March category.